We sell top quality, traditionally reared beef, lamb, mutton and rarebreed pork direct from the heart of the Northumberland hills. It really is as simple as that. Because that is how we like it. 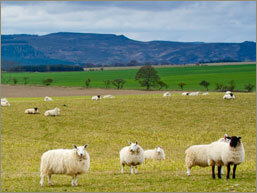 Tastes good, is reared traditionally & allows the consumer a peace of mind and very tasty meats. We can supply everything from a pack of sausages or burgers, mince or stewing steak, chops and roasting joints to a half pig or lamb for your freezer! Our aim is to provide the leanest, freshest and finest tasting meats. Please feel free to download a PDF of our current price list. If there is something you fancy that isn't on there, simply drop us a line by either e-mail or phone us on 01669 650012 and we'll see what we can do. We're always pretty busy on the farm, so if you do get the answer machine, please do not hesitate to leave your name and number and we will get back to you! You will need Adobe Reader to view this document. You can download it for free from the Adobe Reader Download page. "Just to say we had our rack of lamb I collected from you a few weeks back and it was exceptional. Personally I would normally go for leg but we\'d eaten that! The quality was superb. "